Dock Levelers are your bridge to your companies efficiency, productivity, and profitability. Crossing over these units will be most of your deliveries and shipments. When deciding on a dock leveler there are several options to consider to optimize safety and loading productivity while maintaining a slope thats reasonable from the facility floor to the trailer bed all while floating above or below dock height to reach the bed of the trailer. When deciding on what type of leveler suits your needs best, whether it be hydraulic, air powered, or mechanical (manual) depends on frequency of use, maintenance, and affordability. Air and hydraulic units need little maintenance and are easiest to use but will cost more due to the automation side of these. Where as the mechanical (manual) leveler are the lowest cost option but require physical strength to engage and disengage with each and every use. When it comes time to decide which best suits your needs we will be here to assist you with any questions you may have. The RHH Hydraulic Dock Leveler offers safety and reliability with the smoothest transitions in the industry. Vacant dock drop-off protection - Exclusive Safe-T-Lip barrier protects against open dock accidents. The Safe-T-Lip barrier can stop a 10,000 lb (4535 kg) fork lift traveling at 4 mph (6.4 kg/hr) from going over the edge of the loading dock. Automatic free-fall protection - Dependable hydraulic velocity fuse stops rapid leveler descent within 3" (76 mm) with a heavy load on the platform. Exclusive Safe-T-StrutTM maintenance support system protects personnel during clean out and inspection and provides lockout/tag out capability. 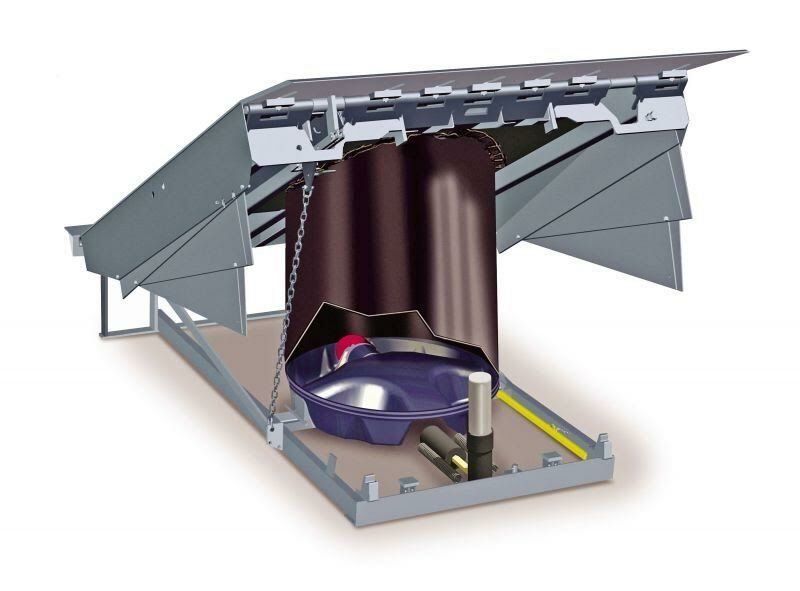 The unique through-the-lip design keeps the strut in place when the leveler is raised to the highest position or is impacted by lift truck.